Identity Design Dubbed "The Old Pueblo," Tucson is a fast-growing city known as much for its metropolitan sophistication as for its unique blend of cultures. Vast deserts, green canyons, and stunning sunsets over majestic mountain ranges form an impressive backdrop. 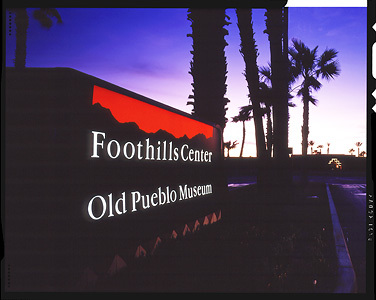 Foothills Mall, an enclosed regional shopping center tucked in the foothills of the Santa Catalina Mountains, was looking to enhance its customer demographics through the revitalization of the mall, including a new addition of the Old Pueblo Museum as well as fine dining specializing in Southwest regional cooking. Design Latitudes was retained by the developer, Eastdil Realty of San Francisco, to create a sparkling new brand for their property. We designed and produced a comprehensive identity program including both print and environmental applications as the mall became Foothills Center and the success story became regional history. Our concept expressed the atmosphere of fun, festivity, and discovery through southwestern vernacular graphics applied to a rich variety of applications and activities.